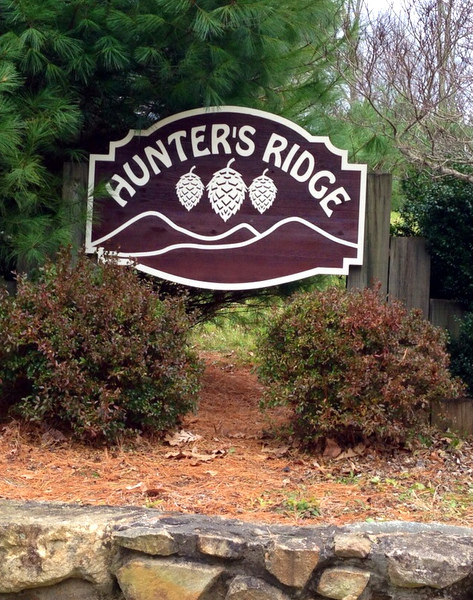 Above is shown a carved and sandblasted Cedar wood property sign for "Hunter's Ridge" residential community. This cedar sign's background is first carved out with a router (incised), with the outlined text, border, mountains, and pine cones elevated. After priming, the sign's background is then painted brown and the text, border and art are hand-painted white. Two layers of clear-coat are applied to protect the sign against scratches and UV fading. This one of several signs made for this community; it is mounted on a fence, whereas others were mounted on two posts. The sign can be mounted on a gate, wall, a fence (as shown), on a post or between two posts, or hung from a wood or iron hanger from the eye-hooks on the top.